Botanical Name: Passiflora singaporeana (syn. 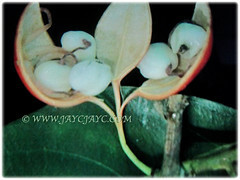 : Adenia macrophylla var. singaporeana). Common Names: Large-leafed Adenia, Singapore Adenia. 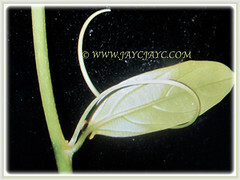 Plant type: An ornamental and perennial vine. Features: Passiflora singaporeana is from the genus Passiflora that consists of about 550 species of flowering plants.It is a fast-growing slender woody vine, climbing with tendrils borne from flower-bearing branches, reaching up to 25 m tall with support. Typically spreading widely amongst tree crowns but main plant usually difficult to spot unless when flowering. Its evergreen, green and petiolate leaves have thickly leathery blades that are usually oblong to lance-shaped, measuring 5-15 by 1.8-8 cm, with two spoon-shaped glands at either side of the base. Leaves are alternately arranged along the stems. The plant is monoecious, producing only male or only female flowers on the branches. The former is produced in much larger proportion. 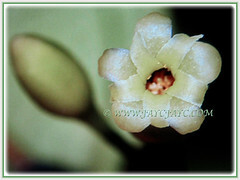 Flowers of both sexes are yellow, tubular, less than 1 cm wide and arranged in hanging clusters. 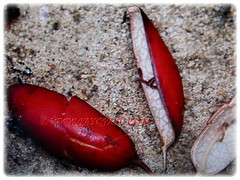 Eventually, each flower will be followed by simple and shiny red fruit which is capsule-shaped, about 5 cm long and splits along three lines from the apex to reveal 15-40 seeds each. 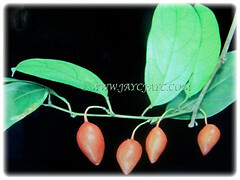 Culture (Care): Passiflora singaporeana or Large-leaved Adenia can be easily grown with least maintenance. Propagation: Easily propagated by seeds which germinate easily or by cuttings. Cut surfaces should be handled with caution, as Adenia genus is known to contain toxic sap which is poisonous if ingested by vetebrates and may cause skin irritation in sensitive individuals. 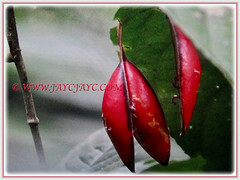 Usage: Passiflora singaporeana or Large-leaved is suitable for planting on trellis in parks and gardens for its attractive ornamental red fruits. Great to be grown in small gardens, vertical greenery, arbour and pergola. Ideal to be grown in a pot or planted in the ground. 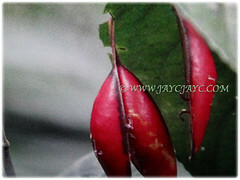 It is also a caterpillar food plant.